The term fine dining brings to mind many images, from crisp white tablecloths to waiters in tuxedos. Fine dining, just as the name suggests, offers patrons the very best in food, service, and atmosphere. It is also the highest priced type of restaurant you can operate. 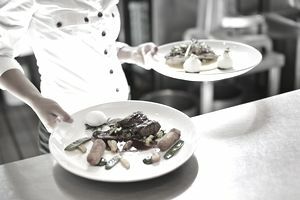 Keep in mind that you may bring in a lot of money operating a fine dining restaurant, but you also will pay out more money than if you were running a casual diner or café. There are three main areas of focus with a fine dining restaurant: The menu, service, and atmosphere. Many people choose fine dining restaurants for a special occasion, so the food must not disappoint in either selection or quality. You don’t need a huge menu, but it should be interesting, offering unique items that patrons wouldn’t find at any other restaurant. A hallmark of today's fine dining is locally sourced foods. A top menu trend for almost a decade, local produce, meats, and seafood offer superb taste and instant value. Many fine dining restaurants offer prix fixe menus. These limited menus change on a daily or weekly basis, and the selections often depend on locally sourced foods at their peak of freshness. Your chef will expect to exercise creativity when designing dishes to fit with the season. All fine dining wine and liquor selections should be on the high end. No Bud Light is needed, although a selection of craft beers will appeal to many of your patrons. Focus on top shelf liquors and a wide selection of cognacs, brandies, and other after-dinner drinks. Your wine list should complement your menu. Fine dining servers should be trained to suggest a wine or beer choice for each menu dish. The staff must be rigorously trained and ready to answer any and all questions customers may have about a menu or a wine. They should also be ready to make menu recommendations if asked. No detail is too small to pay attention to in fine dining. Fine dining was once synonymous with snooty waiters and French names. Today, fine dining can be in any type of setting and feature a wide variety of cuisine, from ethnic to organic, local fare. Standards you should always include in fine dining are fine china, glassware, and flatware. Tablecloths are expected. In these flexible days, the rest of the atmosphere is up to you. You can take the traditional route with silver candelabras and rose centerpieces, or go for hip and trendy with a bold color scheme and modern furnishings. Music playing subtly in the background should reflect your themes, such as classical for a traditional room or jazz standards for something modern. Lighting should be subtle, leaning toward dim for a romantic ambiance. Fine dining requires a great attention to detail, but it can pay off in the end when you have reservations months in advance. Ultimately, customers should feel that the money they spent at your restaurant was well worth it. Is a Fine Dining Restaurant Right for Your Business? What Are 10 Important Facets of a Fine Dining Restaurant? Are Healthy Restaurant Concepts Successful?